The Red Sox lit up four Royals pitchers for thirteen hits, and Chris Sale (pictured) provided 8.1 solid innings in an 8-3 win over Kansas City on Tuesday night at Kauffman Stadium. The victory, combined with the Yankees' seventh straight loss, put Boston in sole possession of first place in the American League East. The Red Sox erased an early 1-0 KC lead with a run in the top of the third on a Mookie Betts single that scored Deven Marrero. An inning later, Boston plated four more on RBI doubles by Sam Travis and Sandy Leon, and a sacrifice fly by Marrero. They scored three more to put the game away in the top of the sixth on a run-scoring double by Chris Young and a two-RBI single by Xander Bogaerts. Young led the Red Sox with three hits. Bogaerts, Leon and Marrero each had two. 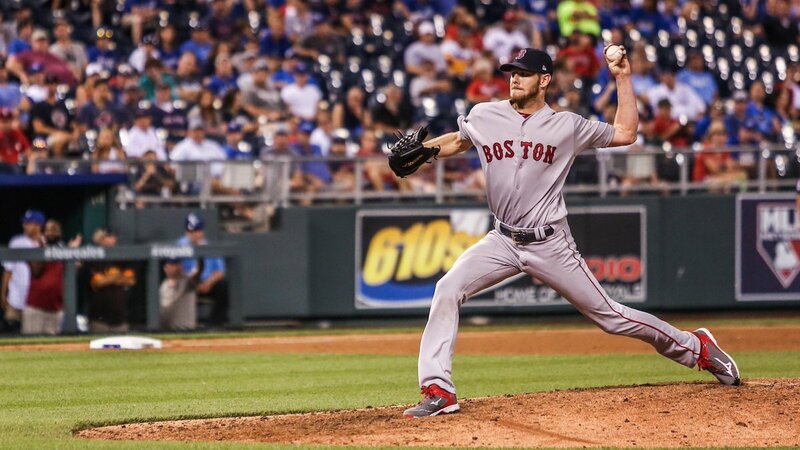 Sale won his ninth game of the year against just three losses. He struck out ten, scattered four hits and walked just one.